Southern star Suriya, who makes his Hindi debut with 'RC2', is so confident about the strength of his character that he doesn't find any competition with co-actor Vivek. It is a known fact that Vivek won a lot of appreciation after the release of 'RC'. 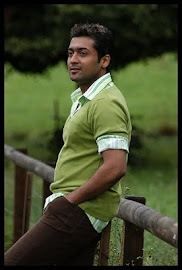 But Suriya is sure to match up to the audience's expectations. He says, "I just had to be positive and honest. I didn't think about Vivek or for that matter what I had done in the past." Speaking more about his character Suriya said, "I had to be passionate about this character 'Suriya', his thoughts, his point of view. What he felt was right in his own philosophy. I had to think about the kind of things that had happened to him, what he had gone through, how he felt he was right and how he believed what he saw." The actor informs that he was so involved playing his part in 'RC2' that he finds no competition with Vivek. "Tell me, with so much thinking to do already, would I have had time to think about anything else, let aside any rivalry or competition," He quipped.